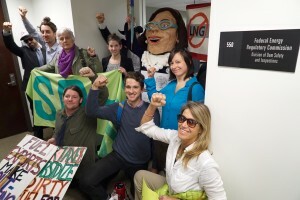 Please give Governor Kate Brown a call and let her know you oppose natural gas exports! Her phone number is 503-378-4582. 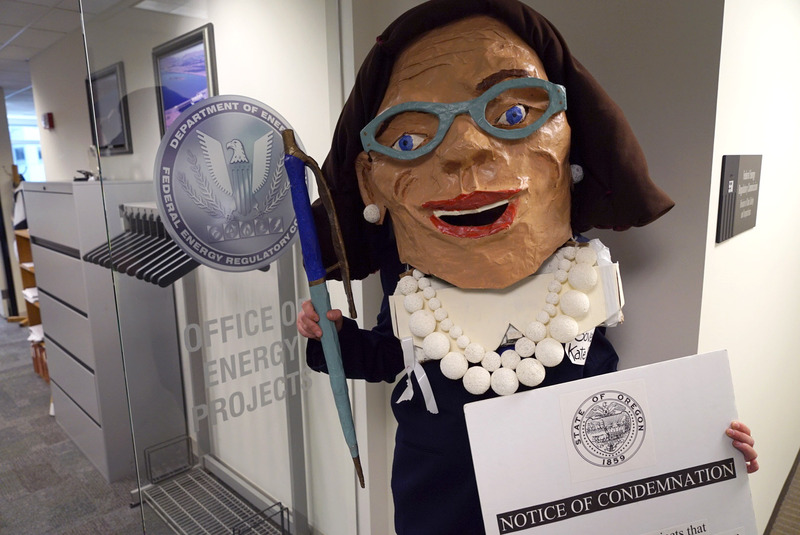 Portland, OR – Governor Kate Brown made a public declaration of opposition to the transportation of natural gas for liquefaction and export in Oregon today at the downtown Federal Energy Regulatory Commission (FERC) offices. Additionally, Brown used her executive powers as governor to use the power of eminent domain to issue a Notice of Condemnation of FERC’s presence in Oregon. Brown stated “The legal right of eminent domain is government’s right to take private property for public good. I wouldn’t seize a federal agency office without good reason unlike, for example, FERC’s willingness to give multi-national corporations the power to use eminent domain to build export pipelines for corporate profit. In this case, it is in the clear public good of the state of Oregon to use my power as governor to oppose FERC’s rubberstamping of destructive pipeline projects.” A broad coalition of Oregonians across the state object to FERC’s September 30th approval of a Final Environmental Impact Statement on the Pacific Connector Pipeline Project and Jordan Cove liquefaction plant in North Bend and to the plans for the Oregon LNG project in Warrenton. Governor Brown further stated “Clearly the public good of the state of Oregon is combating climate change by keeping fossil fuels in the ground and the protection of forests, watersheds, and rural communities.” Brown’s decision to use eminent domain against FERC is unprecedented but nonetheless follows in the footsteps of Governor Kulongoski who in 2010 threatened to sue FERC over the Jordan Cove project. “I stand today with other shining examples of historical Oregon leadership on environmental issues.” said Brown. Brown also made it clear that the state agencies who would also have to approve LNG projects in Oregon including the Oregon Department of Environmental Quality and the State Land Board would stand with her in promoting the best interests of Oregon communities. Both agencies have previously rejected LNG proposals in 2010. In Medford, members of Southern Oregon Rising Tide addressed Senators Wyden and Merkley at a climate change conference this morning. Activists and community members called on the Senators to “walk their talk” on climate change and to take a public stance against the Jordan Cove LNG export project. Rising Tide is an international, all-volunteer, grassroots network of groups and individuals who organize locally to promote community-based solutions to the climate crisis and take direct action to confront the root causes of climate change. LEARN MORE ABOUT LNG EXPORTS IN OREGON at our panel discussion on October 22nd.